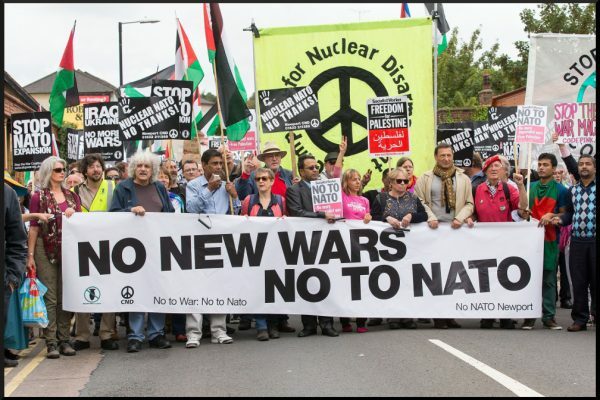 Voices Rising for Yemen – Final Day – Stop the Wars at Home and Abroad! 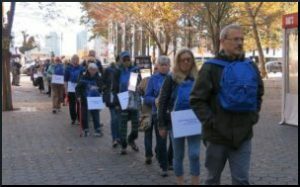 By 11:30 this morning, on Dorothy Day’s birthday, about 90 people had gathered at the Isaiah Wall for a procession to the Saudi consulate. 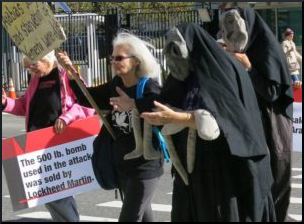 The mourning women led our march, garbed in large masks and veils, holding limp grey dolls that represent the thousands of children facing death in Yemen. Jun Sun and a companion followed, their drumbeats guiding us. Six people carried placards describing the terrible attack on a children’s schoolbus in northern Yemen. The attack happened on August 9, 2018. This week in Yemen, children who had survived were going back for the first time to their classes, carrying their blue U.N. backpacks from the day of the attack, splattered with their classmates’ blood. 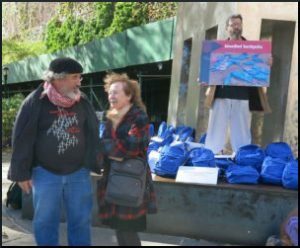 So today in New York, people willing to risk arrest carried blue backpacks and signs naming the children who had been killed. Others followed with banners. Nick Mottern joined us with a drone replica, an apt reminder of U.S. aerial attacks and drone surveillance in Yemen. We sang and chanted for over two hours. At least two dozen police carrying plastic cuffs arrived, along with a NYPD Detective named Bogucki, who told us he recalled arresting some of us during the late ’90s and in the years leading up to the Shock and Awe bombing in Iraq. 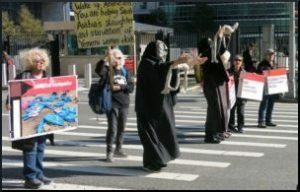 From 1996 to 2003, we had protested the sacrifice and slaughter of Iraqi children. Detective Bogucki said we are preaching to the choir when we tell him about crimes happening inside the consulate, and other off ices that prolong war in Yemen. Recognizing our complicity, we believe “the choir” must unite by resisting child sacrifice, child slaughter. 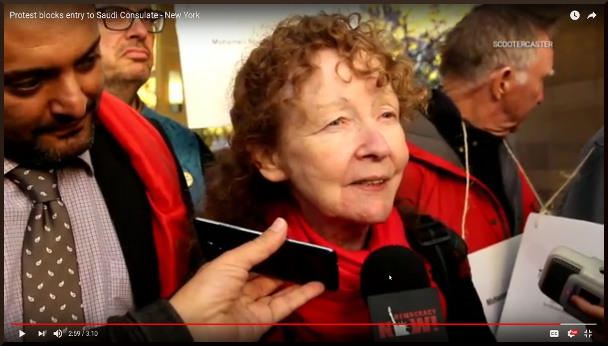 Kathy Kelly is an American peace activist, pacifist and author, one of the founding members of Voices in the Wilderness, and currently a co-coordinator of Voices for Creative Nonviolence. She has traveled to Iraq twenty-six times, notably remaining in combat zones during the early days of both US–Iraq wars. Her recent travel has focused on Afghanistan and Gaza, along with domestic protests against US drone policy. She has been arrested more than sixty times at home and abroad, and written of her experiences among targets of US military bombardment and inmates of US prisons. Previous Post:What to do the day after America’s elections?